Age 92, on April 12, 2019. Julia was a longtime employee of Ramsey County Welfare. Preceded in death by husband Thomas J. Warisch and many siblings. She is survived by son Mark Warisch of Laporte MN, daughter Cindi Gilbert (Brad Huehn) of Cambridge MN, grandson Tyler (Kelle) Gilbert of Isanti MN, sister Rose Carlson, sister-in-law Audrey Magnuson and many nieces and nephews. 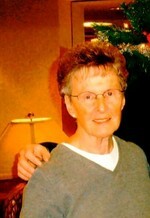 Julia enjoyed being a grandmother, baking cookies for others, gardening and spending time with family at Garfield Lake. Special thanks sand much gratitude to Southview Acres staff for their wonderful care of Julia and family support. Funeral Service 10:30 a.m. Thursday April 18, 2019 at the KANDT & TETRICK FUNERAL HOME 140 8th Ave No. South St. Paul. Family will greet friends 1 hour before service on Thursday. Interment Ft Snelling National Cemetery. In lieu of flowers memorials preferred.